What’s Wrong With My Electric Water Heater? Imagine: you’re in the middle of a nice, hot morning shower. Then, without any warning at all, your shower is neither hot nor nice. Your water is freezing. After leaping out of the shower, you’re probably only thinking one thing (well, one blog-appropriate thing): why did that just happen?! So: Why Did That Happen? The case of the missing hot water is no great mystery. In all likelihood, there’s something wrong with your water heater. Electric water heaters heat up water using electric heating elements located in the upper and lower sections of the heater’s tank. If the electricity supplying power to these heating elements isn’t working, they won’t work. When the heating elements aren’t getting power, they can’t heat up any new hot water. Then, once you’ve used all the hot water in the tank, you get your unpleasant shower surprise. Electric water heaters are high-voltage appliances, which means they take 240 volts to run properly. By contrast, your home’s outlets only use 120 volts. Because they use so much power, high-voltage appliances like your water heater are usually connected to their own dedicated circuit. This circuit brings us to the most common reason why you’re not getting hot water. If your electric water heater isn’t running, the first thing you should check is its circuit breaker. Most likely, the water heater’s circuit breaker tripped recently. 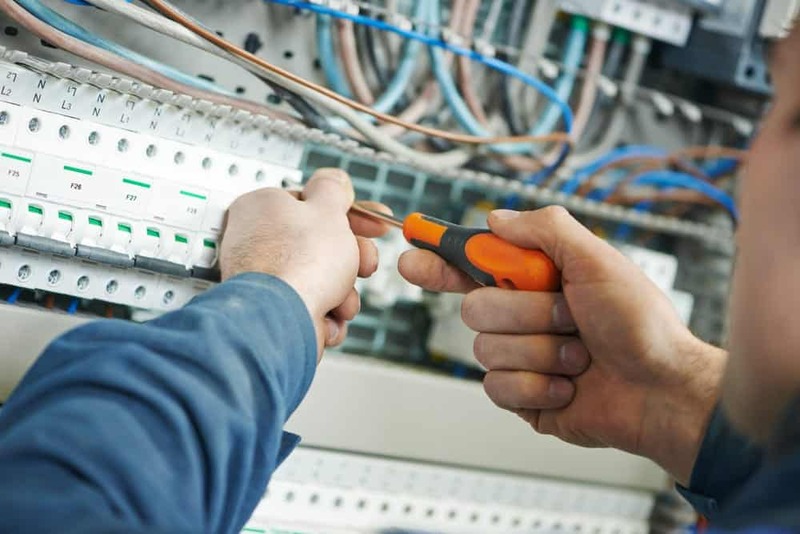 When circuit breakers trip, they “break” the circuit (get it) supplying power to the device they’re connected to. Without that power, the device (in this case, your water heater) can’t function. Find your home’s central service panel (or electrical box, circuit panel, fuse box, junction box–whatever you call it). The circuit breaker that connects to the water heater should be labelled. Even if it isn’t labelled, however, you should be able to find it. Just look for any circuit switches that aren’t in the same position as all the other ones. The odd circuit out is probably your tripped water heater circuit. All you have to do is switch the circuit back on to restore power. If you have a fuse box instead of a circuit breaker panel, you’ll have to replace the fuse. What if that didn’t fix the problem? If the circuit isn’t tripped, then it’s time to check the water heater itself. Before you leave your service panel, however, go ahead and turn off the breaker dedicated to the water heater. You don’t want to dig around in your water heater while it still has power, trust us. Once you’ve turned off the circuit supplying power to the heater, you’re ready to begin your inspection. First, take the upper element access off the water heater. Remove the insulation and the plastic safety guard. Be very careful not to touch the wires or electrical terminals. You’ll see a red button right above the upper thermostat. That red button is the high-temperature cutoff reset button. Press it and reset the water heater. Then, replace the safety guard, insulation, and access panel. Finally, go back to the service panel and flip the breaker back on. If that doesn’t solve the problem, you might need to replace the water heater or one or both heating elements. If that sounds daunting, call in a professional electrician. What if I still keep running out of hot water? Sometimes, you have hot water but you don’t seem to have enough. This could be caused by a teenager, but you can’t replace them. Your water heater may also simply be too small. It sounds super simple, but the capacity of your water heater has to meet your water needs. If it’s too small for your home, you won’t get as much hot water as you need. The size of the water heater tank you’ll need depends on several factors, most notably the number of people using it. Obviously, the more people use your hot water, the larger your water heater tank should be. One to two people should use a 30 gallon tank. Add another 10 gallons per person until you hit four people (3 people=40 gallon tank, 4 people= 50 gallon tank). Finally, if you have five or more people living in your home, you should consider investing in an 80 gallon tank. If you seem to run out of hot water frequently, try taking shorter showers, or installing low-flow showerheads. You could also only run the dishwasher or washing machine when no one’s using other water appliances. What if I my tank is the right size but I still don’t get enough hot water? In this case, one or both of your heating elements are probably on the fritz. For you kids, “on the fritz” means “not working properly.” If you’re getting lukewarm water, your upper heating element probably isn’t working. If you get hot water but it runs out too quickly, then the lower heating element probably isn’t working. To fix this problem, you’ll have to replace the faulty heating element. What if my hot water is too hot? One or both of your water heater’s thermostats are probably set too high. To check those settings, you’ll have to open up your water heater tank again. Turn off the power, then remove the access panel, insulation, and plastic safety guard from each heating element. Again, make sure you don’t touch the wires or electrical terminals. Check the heat setting on both thermostats. They should be at the same temperature. The recommended setting is between 115 and 125 F. You can use a flathead screwdriver to adjust the temperature to the desired setting. What if my water heater is making a popping or rumbling sound? You’re probably hearing the sound of boiling water. When too much sediment builds up in the bottom of the tank, the tank might get too hot. When that happens, the water inside the tank might start boiling, creating the sound you’re hearing. Over time, an overheating tank can cause all sorts of other water heater problems, too. You should drain your water heater tank regularly to remove sediment before it builds up. Try flushing it again now to see if that helps with the popping sound. It it doesn’t, you may need to replace the tank entirely. So, there you go. These are simple solutions to a few basic, common water heater problems. The next time you’re having an issue with your water heater, following these troubleshooting tips to figure it out. If you want to take the next step and actually try repairing your own electric water heater, we’re happy to help with that, too. Stay tuned for our step-by-step walkthrough on how to replace the heating elements in your water heater. Of course, if you don’t want to replace your own heating elements, we’d understand that too. If that’s the case, just give EarlyBird a call instead. We’ll get your water heater gets the power it needs, so you can get the hot water you need.